Brenn-O-Kem (Pty) Ltd was started by a large German group of companies (Benckiser) in 1968 with the purpose to collect filter cakes from the wine industry for the production of tartaric acid in Germany. The late Chris du Toit, the previous Chairman of Brenn-O-Kem, oversaw the production of the plant that was started in the buildings of the Old Waverley blanket factory, just outside Wolseley. Some of the original buildings, erected in 1875, where blankets were produced during both the Anglo-Boer and First World Wars, are still in existence today. After the German group sold the company during the 70's, Chris took over the company, which over the years had various shareholders, until the du Toit family became sole owners in 1997. Chris passed away in 2001 and the second generation sons, Kobus and Wynand du Toit have continued to manage the company until today. Brenn-O-Kem is all about recycling by-products of the South African wine industry, such as skins, seeds and lees to produce value-added natural products, including Oxiprovin made predominately from Grape Seed Extract. They also produce cream of tartar, raw materials for the production of tartaric acid, alcohol and grape seed oil. Brenn-O-Kem's products are manufactured to international standards and are exported to Europe, North and South America, Asia and Australia. What's left after processing and burning is a tiny fraction of the volume of the original grape skin and seed mix that is delivered. This final waste product is then recycled as compost, which breaks down and becomes more accessible much faster than the unprocessed skin and grape waste. Oxiprovin, a potent antioxidant, effectively protects your cells and the DNA of your cells against diseases and conditions associated with free radical damage such as inflammation, arthritis and poor blood circulation. 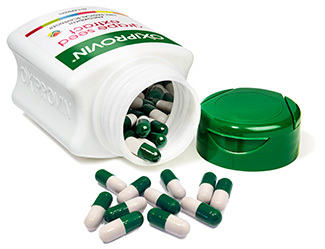 Oxiprovin is a 100% South African product. The raw source is obtained from local vineyards and processed by Brenn-O-Kem according to strict standards to provide a high quality product to the public. This methodology ensures a much fresher product than importing the raw material and processing it locally. Brenn-O-Kem is the only company in South Africa that produces Grape Seed Extract and we only use the highest quality seeds for our products. Oxiprovin only contains grape seed extract as active ingredient and no other additives. Brenn-O-Kem is the only company in South Africa that producers Grape Seed Extract and we only use the highest quality seeds for our products. The purest grape seed extract is used for Oxiprovin with no other additives or ingredients. Obtaining benefit from these proanthocyanidins can only be attributed to the grape seed extract as no other sources are added.